The Talaso Atlantico hotel is located near the village Mougas, and is housed in a classical granite building magnificently located built into the mountainside with dramatic views of the sea. 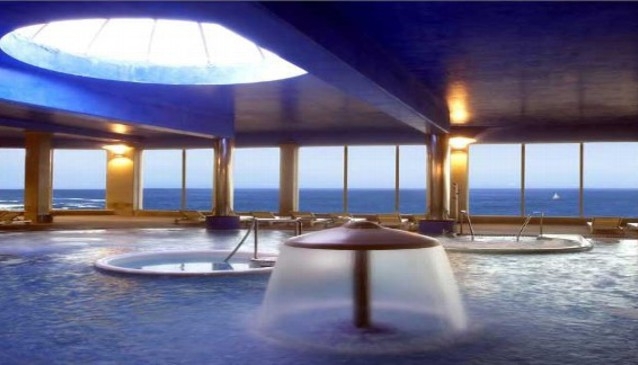 This contemporary four-star hotel has a thalassotherapy centre, which uses seawater for healing purposes together with gymnasium,hamam(turkish steam baths) and sauna. There is also a restaurant,bar and jamoneria and banquet facilities. In addition, there is a boutique,beauty and hair salon and childrens play area. The hotel is only 5 minutes from Baiona and Tui/La Guarda are also within easy reach.Santiago is just over an hour and Porto an hour and a half.